As yet, a robot welcoming tourists or business travellers at the hotel reception is not an everyday occurrence. However, according to the first global survey by Travelzoo on the subject, willingness among travellers to accept robots as service staff appears to be high. 6,200 people in nine countries took part in the survey. The findings were presented by Richard Singer, president of Travelzoo Europe, at the ITB Marketing and Distribution Day at the ITB Berlin Convention. Accordingly, most people said they had no fear of robots. At 40 per cent, only a minority found the idea of a robot intimidating. 77 per cent assumed that in a few years robots would play a large part in our daily lives. A large majority of 73 per cent saw this development as positive and thought that overall, robots would improve their lives. Acceptance of robots varied greatly from country to country. Germans appeared to be somewhat sceptical towards robots helping out. 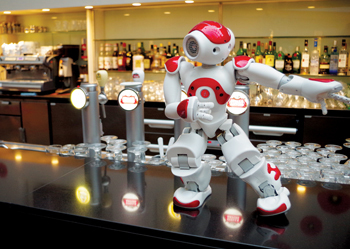 30 per cent of German respondents rejected the idea of a robot at the hotel reception. Asians and in particular Chinese were keen on innovation. Thus, 57 per cent of Chinese respondents would definitely welcome unaccompanied robots. In Brazil, many people said they would accept robots in the tourism industry. For the most part there was no great inclination to let robots look after customers on cruise ships or on flights. However, 74 of respondents said they could imagine robots as hotel doormen. 69 per cent said they would accept them as restaurant service staff and 68 per cent each would accept robots at tourist attraction check-ins or as room service personnel in hotels. According to the survey, the advantages of using robots were, compared to humans, quicker processing of information and zero fatigue (81 per cent each), communication in several languages and a better ability to learn languages (79 per cent), as well as reducing human workloads of menial chores (77 per cent).